Grain Direction? : Grain direction doesn't matter. Grain direction parallel to short dimension. Grain direction parallel to long dimension. Six Square Feet (24" x 36") Teak Veneer Plywood Panels -- 6 sq. 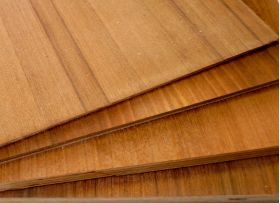 ft. 1/8" & 1/4" thick panels have FEQ teak veneer on one side only; 1/2" & 3/4" thick panels are veneered on both sides. Plywood substrate is exterior grade. Our handling charges range from a few dollars for small shipments sent in standard boxes, to several dollars for custom-built packages required for large/heavy plywood shipments, or for packages that require extra protection against damage. 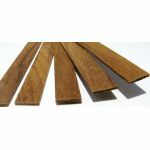 In all cases, we try to hold our shipping costs to a minimum while ensuring that the teak veneer plywood you order order shows up in excellent condition. Perfect for my project. Fast & easy. Packaging was outstanding, wood was in perfect shape apon arrival. Just as advertised and delivery was quick. I really appreciated the call I got about a question I e-mailed you. Excellent service! Very nice piece of wood. Well packaged and quickly delivered. Order received today. It was shipped the day of the order and the packing was beyond excellent. Price was also right. I will spread the word.